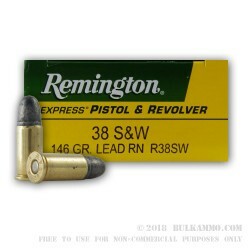 This .38 S&W LRN 146gr ammo by Remington is the perfect range and practice ammo. It’s designed with target shooting in mind. This low recoil lead round nosed bullet is great for those just starting off, or even the seasoned shooter. Not to be confused with the .38 Special, which is a completely different round and NOT interchangeable. Although close in name, that is where the similarities stop. The .38 Special has a different shape case and slightly larger diameter bullet. So be wary of what you purchase and place in your weapon! The .38 S&W is a wonderfully accurate round that doesn’t have a tough recoil and isn’t an ear blaster like some other rounds. 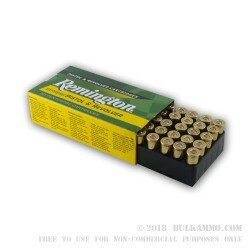 These rounds are brass-cased, boxer primed, non- corrosive and reloadable! Developed in 1877 by Smith & Wesson, the .38 S&W became the standard revolver cartridge of the British military until the 1960’s. 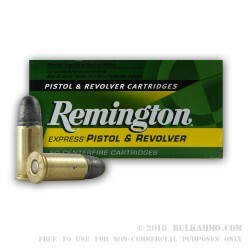 These Remington .38 S&W rounds are 146gr lead round nose bullets. Muzzle velocity is 685 ft/sec with muzzle energy at about 150 ft/lbs. Load up for the range!